Andy: Wow…this is delicious. You can really taste the hazelnut and vanilla flavors. It has a nice dark rich color and is exceedingly smooth. 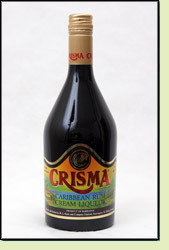 If you are a fan of Bailey’s I would definitely try Crisma, as I actually prefer it. To me, the sweetness of rum lends itself better to a cream liquer than whiskey does, and Crisma really takes advantage of that. If you like Bailey’s, I would definitely ask your local liquor store to order some if they don’t already carry it. You won’t be sorry. Adrian: This is really good. Very tasty and smooth. You can drink this directly over some ice. It needs no mixers. I love the hint of vanilla you get with this delicious cream liquer. It is definitely a great alternative to Bailey’s.